amplifié par un important retour médias. Outil marketing qui s’adresse à un très large public, la montgolfière publicitaire engendre une mémorisation positive grâce au fort capital de sympathie dont elle jouit. Son image positive est dans l’air du temps : Proche de l'environnement et de la nature , évoquant le rêve, l'évasion, la légèreté, la douceur. 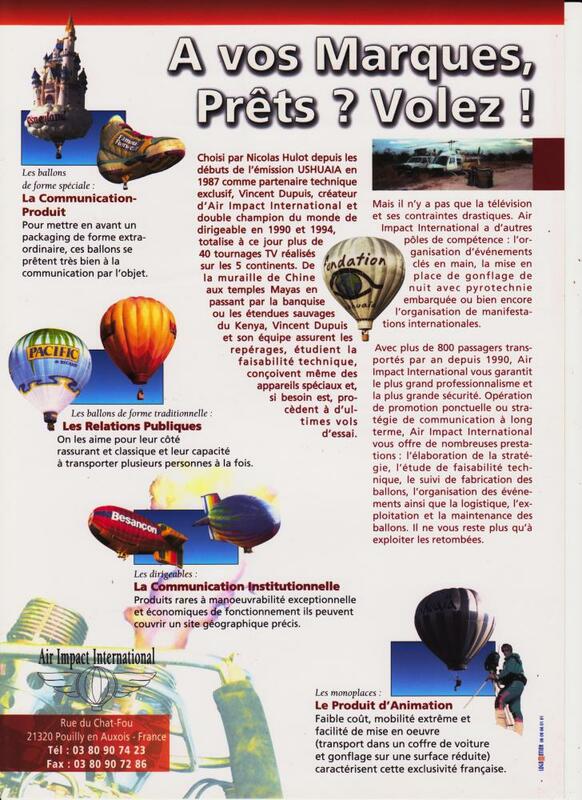 La diversité des actions et des interventions, ainsi que la combinaison avec d’autres outils de communication constituent les véritables atouts de l’exploitation d’une montgolfière publicitaire. 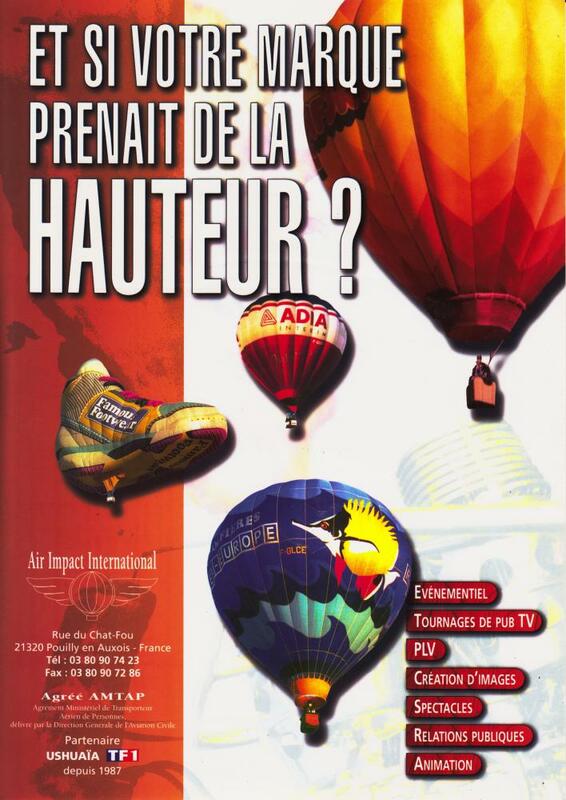 Nos 30 années d' expérience sous le label Air Impact International nous permettent de vous conseiller pour l’intégration optimale de votre montgolfière à vos prochaines campagnes . En fonction de vos attentes et de votre budget, nous définissons ensemble le type de communication et d’évènements afin de cibler votre clientelle. Why should I use a balloon now for my product or company? Corporate Hot Air Balloons have been in use since the 1960’s, both as promotional tools for brand or corporate awareness and for providing incentives and inducements. Even today many people will still remember the Nimble balloons used in advertising after nearly 40 years. So why should I use a balloon now for my product or company? 1. Balloons will always draw massive attention. People the world over like Hot Air Balloons. Wherever a balloon is in the sky or on the ground it will always draw a crowd of people. Many surveys have shown that up to 100% of those taking part in the survey confirmed that balloons draw their immediate attention compared to much less with any other form of advertising. 2. Balloons create a tremendous impact and people like to talk about what they have seen. Once again surveys have shown that the public at large generally agree that balloons are interesting and consequently they want to talk about them. Far more will talk about a balloon with your name on it than say a billboard poster. Remember the earlier comment about the Nimble balloons. Recent surveys confirm that in countries where balloons are operating most people can remember the name of balloons that they have seen in the sky. Whereas in comparison, very few could remember billboard posters. 4. The balloon image gets recorded. Now imagine your corporate balloon as the worlds biggest bill board or advertising poster. This is what a balloon can be and for sure everyone will remember it. As we have said, statistics have proved that the recall rate for balloon advertising is much greater than any other form of advertising. People always look up when they see a balloon in the sky. Because of its huge size, it is very difficult to miss and because it is in the sky they are surprised yet excited to see it. It draws their immediate attention time and time again. No matter how many balloons people have seen they never seem to loose their fascination. On many occasions people will follow a balloon for long distances just to get a closer look or to take a photograph. How many people do you know who will look at an advertising billboard for more than a few seconds or will tape record a TV advert? Many many people take photographs and videos of balloons. Whether it is the shear size and colours, their grace of movement or the spirit of adventure, balloons attract attention and people want to record that in photographs to look at time and time again. Look in any greetings card shop and you will see at least one card with a photograph of a balloon on it. Look in holiday company literature and brochures promoting tourist venues. You will see a photograph of a balloon. People like balloon photographs. Television companies also enjoy the colour and the attraction that balloons have. They love to cover ballooning events where there is the strong combination of balloons and crowds of people. Imagine the impact your company logo can make using a balloon as an advertising medium. Statistics indicate that compared to other forms of advertising, balloon advertising can work out much more effective with much lower cost per thousand people reached. Newspaper and magazine editors have a similar interest in balloons and balloon events. These events are regularly reported and recorded with photographs. However Balloon advertising should not be seen as a replacement for other form of advertising. What it does do is raise awareness of the company, brand or organisation. It has been proved time and time again that other form of advertising benefit greatly when a balloon sponsorship is also used. It should also be noted that balloons would not be normally used for special weekly product promotions. Balloon images are remembered for a long time. This is the tremendous advantage of using this media. Are there other benefits in operating a corporate advertising hot air balloon? Yes - Corporate entertainment or staff incentive flights are just one example. As we all know, corporate entertainment and staff incentives exist in many forms but most people now recognise a balloon flight as a particular high value item and this can benefit both the company and brand image in a number of ways. Yes - The balloon-operating programme can be supported with promotional items such as branded clothing, pins, key rings, badges posters and cards. Many companies choose to use these promotional items with their balloon and gain further brand exposure long after the balloon has been packed away in its bag. It is well known that people will wear branded clothing where the brand is shown on a balloon who would not otherwise wear any form of branded clothing. How can I find out more about a Corporate balloon and who can assist me? The Air adventures team have many years experience of designing and producing Corporate Hot Air Balloons. We also have a team of specialist personnel who can work closely with you and manage your Corporate Hot Air Balloon programme so as to achieve optimum results. They will be able to discuss your special requirements and advise you how a balloon programme can work best for you as well as explaining all of the costs involved. Act now by emailing airadventures@laposte.net We will then put you in contact with one of our specialists who will be able to talk with you in strictest confidence about your ideas. Corporate Balloons really work. Make one work for you.